Once the project is completed, a train car will need to pull up to the right section of a rail station and line up with limit switches. From there, an operator will be able to push a button to start the process of moving powdered cement mix from the train. As work continues on a silo project for City Concrete, Jason Rubin, president of CR Electric, couldn’t be happier with how everything is coming together. Rubin said CR Electric first sat down with City Concrete, looked at their design and took it from there. 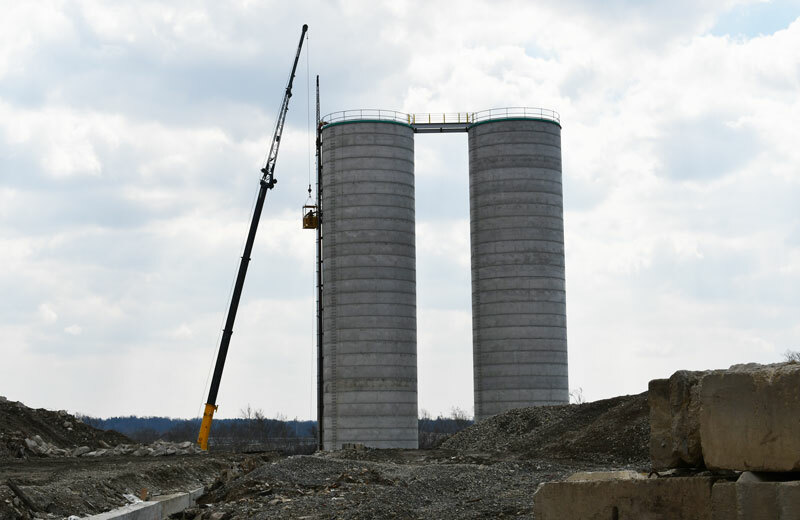 The cement will be sucked down a duct system about a quarter mile in length to two silo towers, each standing 180 feet and able to hold 4,000 tons of cement. A crucial portion of the project was two control panels built by CR – a rail house scale control panel and silo control panel. “Those are kind of the brains of the operation,” Rubin said. “We have our VFD drives, computers and fiber optic in there. Those will communicate with everything out here to know where the cement is at, how fast it’s being moved and how it’s filling up in the silos. 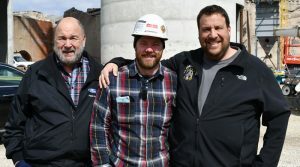 (From left to right): Marc Rubin, Bob Thomas and Jason Rubin stand near one of the 180 foot silos that can hold up to 4,000 tons of cement mix. Rubin’s father, Marc, has played an important role throughout the project. Rubin also noted how the weather has been an interesting factor to deal with. 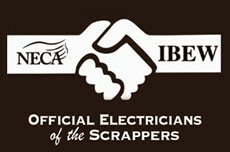 Initially, CR Electric went through over 100 drawings, which was then whittled down to 14 final drawings.